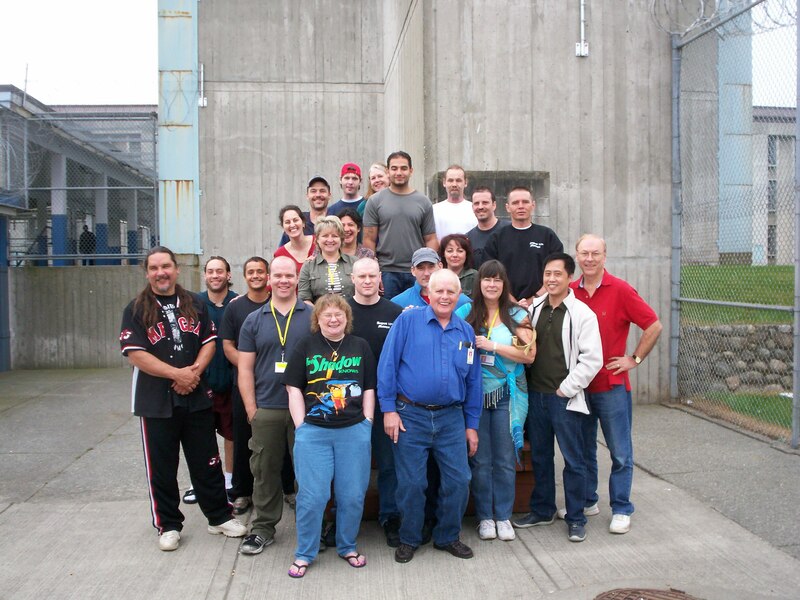 Ed Griffin (center) teaches creative writing at a medium security prison in Western Canada. He taught the same subject at a maximum security prison in Wisconsin. He began his professional life in 1962 as a Roman Catholic priest in Cleveland, Ohio. There he became active in the civil rights movement and marched in Selma with Doctor Martin Luther King. Removed from a suburban parish for his activities, he served for three years in Cleveland’s central city. His years in the Roman Catholic Priesthood are the subject of his next novel. After leaving the priesthood in 1968 he earned a masters degree at the University of Wisconsin-Milwaukee and was elected to Milwaukee’s city council in 1972. Griffin and his wife, Kathy, opened a commercial greenhouse in suburban Milwaukee in 1976. They lived where they worked and shared the joys of raising children and growing flowers. In 1988 the family, Ed and Kathy, Kevin and Kerry, moved to British Columbia, Canada, where Griffin helped establish a dynamic writing community in the city of Surrey. He is the founder of Western Canada’s largest writer’s conference, the Surrey Writers’ Conference. Really proud of you, Brother. Joined your blog. Not sure how to comment on your identity piece, but prison seems to be physical, emotional and spiritual punishment. Why can’t it be rehabilitation? Thanks for your comment, Joy. It’s great hearing from a sister on this blog. I too am very grateful that you started this blog. There are so many negative postings on prisoners out there that we need to counterbalance it! I have been doing my part by responding to the negative ones and will continue to do so. When I started following your blog, I didn’t know where it would lead. Most recently, it led me to Dystopia and Bend Over and Show Your Lobster — and to I.M GreNada’s blog and newspaper columns. I’m a fairly new author whose main concerns are injustice, slavery, the abuse of power, etc. I’ve been trying to figure out how to write about those subject in fiction in a way that will open people’s eyes. But the balance between entertainment and truth is very difficult, and what I’ve learned so far is that people prefer to be entertained. Which makes me not want to write any more of the type of books I’ve been writing, and go for more hard-core fiction that refuses to pull punches. But when it comes down to it, books don’t have the power that they used to, and nothing that you or I can say will change much, not at the deepest levels where it counts. So I’ll write the best that I can, and if some of it swings to the entertainment side and makes more money, then I’ll put some of that money where it can be useful in helping individuals. If I can’t find something similar in the U.S., I’ll contribute to the John Howard Society. Thanks for putting yourself out there and being who you are. one year ago. Aunt Cathy- keep your chin up Kelvin. Thank you for your comment, Cathy. It’s important for a man to know that others believe in him. If you do choose to accept the award, technically you should write a post, stick the little pic of the sun on your blog, and pass the award on to others who you think are worth it. I chose to give it to only one person, you, because I believe that nominating 15 blogs simply dilutes the power of the award to highlight important/interesting blogs. Thank you, iarxiv. I appreciate your interest and support. I taught in prison for twenty years. Some days it seems as if I have no material for this blog, but then I search all the stories and articles I edited for inmates and there’s enough material for a book. I suppose that’s true of all of us. We may think our past is boring, but when we really think about it…. stories are there. Thank you for the award. I appreciate that. Thank you for your comment, Sheldon. I’m glad this blog helps. Apparently it was the reason why the prison authorities kicked me out and wouldn’t let me teach anymore. As I’ve mentioned, prison is a very closed system. They don’t like outsiders.